SAC CW Today -Turn on your radio! Scandinavian Activity Contest on CW starts today on Saturday 15 September 12.00 UTC! It’s time ladies and gentlemen, to enter the airwaves with your diths and dashes. Turn on your radio and bring your HF signals towards Scandinavia! We are eager to work you every band possible, so don’t be surprised if you are asked to make a quick QSY to another band. To get and give extra kick to operating, and also to give the public the opportunity to follow the progress of the competition, join the scoreboard. 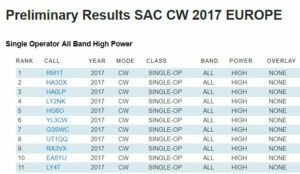 For several years it’s been done in www.cqcontest.net and SAC CW is already opened on the page. Instructions how to connect for each software can be found under “Help“. See you and your scores in SAC! QSO’s that we find with “fake” numbers will be lost, and may also lead to further penalties.Please use fair play and good sportsmanship during SAC!